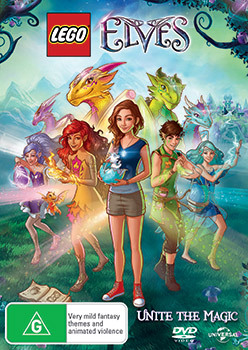 From the entertainment powerhouse that brought us family favourites, LEGO® Ninjago™ and LEGO® Friends™ comes an all-­‐new fiendishly fabulous series, LEGO® Elves™. Step through the portal to another realm and discover Elvendale, the enchanting world of intrigue and mystery. Meet Azari, Naida, Farran and Aira, the Elves that call this mystical land home and join them on their very first magical adventure. In this volume, the Elves of Elvendale are perplexed when earth dweller Emily somehow finds herself in their Kingdom. With no way to get back to her world, Emily befriends the four magical elves who then journey with her to try and find the portal back home. Will they manage to return Emily safely? Or will evil Elf witch, Ragana stand in the way? Find out with LEGO Elves – Unite the Magic, a tale like no other, available to own on DVD from September 8, 2016. Continue the adventures at home with play sets including: Ragana's Magic Shadow Castle and The Precious Crystal Mine.